The husband, manager, and long-time right hand man of the Queen of Rock and Rockabilly has died. 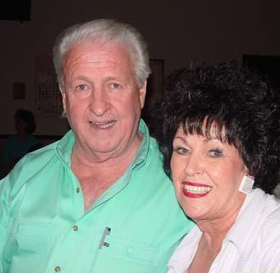 Wendell Goodman, who married Jackson in 1961, passed away on Sunday, May 21st after Wanda Jackson performed Saturday evening at the club Saturn in Birmingham, Alabama. Jackson had also performed at the Nashville Boogie in Nashville on Friday, and Wendell had accompanied her. The news comes as a shock to many fans who just saw Wendell in the last few days. Wanda and Wendell celebrated their 50th wedding anniversary in 2011, and took a trip together to the Bahamas. In recent years, interest in Wanda Jackson has increased after Jack White produced an album The Party Ain’t Over for Jackson in 2011. Shooter Jennings manager Jon Hensley also helped revitalize Jackson’s career in later years. Wanda has become a favorite of rock & roll, country, and rockabilly revivalists, with Wendell being right at her side for club shows and festival appearances. According to NewsOK, funeral services will be at 2 p.m. Friday, May 26th at the Southern Hills Baptist Church chapel at South Lakes, in Oklahoma City. Don’t know much of Wendell Goodman but my condolences to Wanda Jackson. She’s held over 50 concert in Sweden. The first on in Stockholm the 21 of april 1970 and the last one (as I know of ) In a small town called Leksand the 19 of april 2008. I saw her perform at Saturn this weekend, so I was shocked and saddened to read this news. Our condolences to Wanda and her family. I owe my eternal life to Wendel. I loved him and Wanda so much. Both are supreme examples of the love of Jesus Christ. Wendell helped me surprise my husband on his birthday with a surprise meeting with Wanda back in 2015. He was so incredibly sweet. I had never met him, just took a chance and emailed him and he called me back and set it up. Not many people would have done that. Thank you Wendell for your kindness. You will never be forgotten. Rest in Glory.